It’s been quite some years that I’ve been engaged in topics related to global trade, including Customs and logistics. In my discussions with many people (especially those who are not involved in this industry on a daily basis), I observe that there is a need to better understand what trade actually is, and what it entails. This need increases due to the recent debates about “trade wars” vs. “free trade agreements”. Therefore, I devote this blog article to the concept of “global trade”, or “international trade”. According to Wikipedia, “trade involves the transfer of goods or services from one person or entity to another, often in exchange for money”. When talking about “global trade” or “international trade”, we refer to trade where the seller and the buyer are in two different countries. In the current article we refer to trade in goods (i.e. physical products), not in services. What is the difference between global trade and international trade? We consider the two terms as synonyms. Global trade is trade between countries (i.e. international) without limiting the scope to specific countries. Thus global trade, or international trade, covers all trade where buyer and seller are in two separate countries. Does trade necessarily require a sales transaction? Goods are moved for exhibition purposes, and then returned to their home base. Personal belongings are shipped when a person moves from to another country. Who benefits from global trade? How can international trade affect the economy? Trade provides direct and indirect benefits, on the micro level and macro level. When a company can export its products to foreign countries, it has a bigger potential market. Consequently, it can produce more, sell more, earn more money and deliver more profits to its owners (direct benefits). At the same time, the ability to sell more results in a need to employ more staff across all job roles (production, finance, sales, HR, …). This provides jobs and reduces unemployment, thus offering indirect benefits to society. Similarly, the company will be paying more taxes (as its profits increase), and the local government will have to pay fewer unemployment benefits (because fewer people will be unemployed). These are indirect benefits for society. When many companies benefit from exports, and the indirect benefits of export accumulate, we talk about “economic development”, or “economic growth”. In places where there are severe poverty and political unrest, such economic growth may result in avoiding conflicts, even armed conflicts. And hence it can save lives and contribute to a better world. Import has its benefits too. First, it gives citizens access to products that they would otherwise not have. Second, it allows companies to produce products even if they do not have all the necessary components or raw materials (by importing them). When goods are imported, often taxes and import duties are collected, and hence imports contribute to the income of Government. These tax incomes are subsequently used by the Government to invest in social programs, in infrastructure and more. These are indirect benefits for society. Can countries benefit from trade even if they do not export much? Some countries realize economic growth not just from the export of their own products, but from providing logistics services to cargo from and to other countries. For example, Singapore, The Netherlands, and Belgium. Namely, Singapore’s economy heavily relies on Singapore’s role as a transshipment hub between East and West. Similarly, the Netherlands and Belgium serve as gateways to Europe, thanks to the Port of Rotterdam and the Port of Antwerp, the two largest ports in Europe. Much of the maritime cargo in Europe passes through Rotterdam or Antwerp, including cargo from/to all European countries. For example, cargo from Eastern European countries would first be transported to Rotterdam or to Antwerp, where it would subsequently be loaded on an Ocean Carrier traveling to other continents. This is a very common scenario in global trade. How can global trade reduce poverty? The answer for this question is provided above under “Who benefits from global trade”. Trade balance is a country’s exports minus its imports. Consequently, a country’s trade balance is positive if the value of its exports exceeds the value of its imports. Similarly, a country’s trade balance is negative if the value of its imports exceeds the value of its exports. A positive trade balance is referred to as a trade surplus. A negative trade balance is referred to as a trade deficit. What are global trade imbalances? Trade imbalance refers to a situation where a country has a trade deficit with another country. Such trade imbalances can cause political tensions, as in the example of the U.S. and China. According to the WTO (World Trade Organization) World Trade Statistical Review 2017, the top 10 trading countries (trading in merchandise/goods) account for 53% of the world’s total trade in 2016. The same report shows that developing economies had a 41% share in world merchandise trade in 2016. The World Trade Statistical Review 2018 shows that in 2017 these gaps shrunk somewhat (52% and 44% respectively). What is the trade balance between the U.S. and China? The U.S. has had a major trade deficit in its trade in goods with China for many years. The figures below show the trade imbalance, in millions of U.S. dollars (source: U.S. Census website). What does it mean that there is a trade imbalance between the U.S. and China? 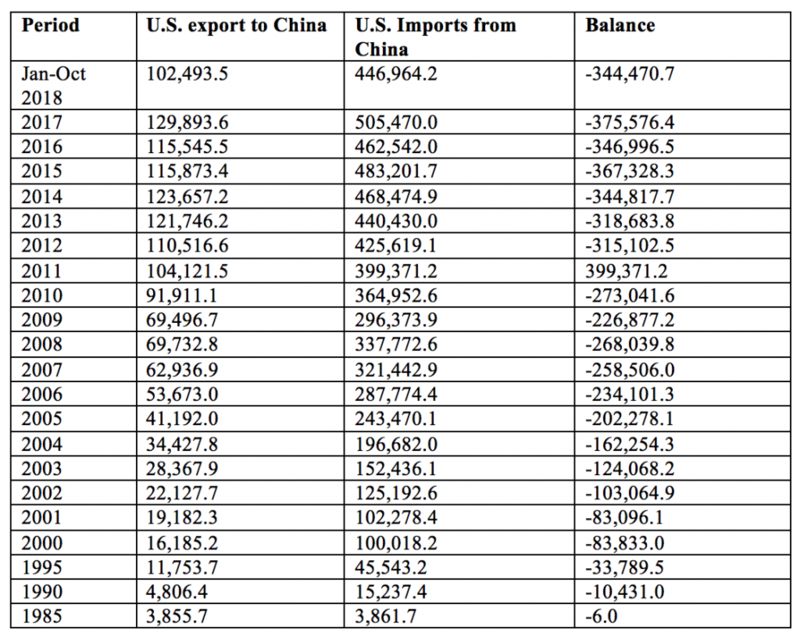 As explained above, the trade imbalance means that the U.S. imports from China substantially more than it exports to China. It means that many products are being produced in China (i.e. supporting job creation in China) and consumed in the U.S., while much fewer products (measured in the value of the products) are produced in the U.S. (i.e. supporting job creation in the U.S.) and consumed in China. Yet these statistics do not take into consideration the cost of labor. Typically, producing a product in China would be cheaper than producing the same product in the U.S.. Hence shifting production to the U.S. may eventually increase the price that consumers are asked to pay for the same product. At the same time, if the U.S. reduces its imports from China, jobs in the logistics sector in the U.S. will be at risk. Inefficient border controls cause a delay (in clearing goods) at the border, which in turn causes disruptions to the supply chains of companies that rely on the goods. Administrative procedures for import/export, e.g. the need to submit paper-based documents, the need to provide the border control authorities extra information, the need to translate documents for the authorities. All these extra efforts by the exporter/importer cost time and money, and hence they make trade less attractive. Complex IT requirements: if exporters and importers are required to submit data to multiple government agencies, they entail extra IT costs. Also, these costs become “costs of trade”, making trade less attractive. When nations impose more and more trade barriers on trade with the other country, one speaks about a “trade war”. In many cases trade wars are the result of protectionism, whereby trade barriers are used as economic weapons. China and the U.S. have been entangled in a trade war in 2018, as both countries have imposed additional import duties on goods imported from the other country. Free trade agreements are agreements between countries or economic unions, aiming to reduce trade barriers as a means to open up each other’s market for companies from the other market. Therefore, FTAs are seen as a means to stimulate export, and thereby to stimulate economic development. FTAs can also be used as a political instrument, helping to promote the prosperity (the economy) of another country. What are international trade agreements? The term “international trade agreement” is somewhat broader than FTA. It refers to any treaty between countries regarding trade. Most international trade agreements remove tariffs (hence they are called Free Trade Agreements) or at least offer preferential treatment, i.e. reducing tariffs but not abolishing them. The latter case is referred to as preferential trade agreement. However, trade agreements can also introduce other measures, such as removing trade restrictions/barriers of any kind. By setting simplifying rules for trade between countries, international trade agreements add transparency and predictability to international trade between the countries at hand. Such transparency and predictability are highly appreciated by the business community, thus creating confidence and increasing the likelihood that companies from the countries at hand will seek to do more business with companies in the other country. Why help promote the prosperity of another country through FTAs? Emerging economies have suffered under the present trade system. In fact, they have suffered since the beginning of the “Age of Discovery” in the 15th century, which led to the birth of global trade. Back then, “global trade” meant that the European conquerors extracted valuable resources from the “new world”, and transferred them back home, gaining wealth through exploitation. Countries that benefited from these practices have historic responsibility towards exploited countries. I discuss this topic more elaborately in the article Trade As Equals vs. Trade War. How can global trade be made fairer? There are many aspects to making international trade fairer. A few of them are listed below. Yet in this discussion, one should remember that global trade is a means, not an end. The ultimate goal is not to make global trade fairer, but rather to make the world fairer. Free Trade Agreements can enhance a more equal global trade environment, where rich countries open up their markets to poorer countries, thereby helping them profit the wealth of the richer countries. It’s often easiest to trade with your neighbors. The costs of shipment/logistics are limited, and often you share more commonalities (e.g. language). Setting up schemes for regional integration can bring stability to local markets. What can affect global trade? Countries, where the cost of production is low, are more likely to export. Countries with high production costs are more likely to import. The cost of production includes the cost of labour, capital, taxes and more. The availability and the cost of raw materials will impact production, and therefore export. Political turmoil causes unrest, which impacts trade. For example, carriers will avoid a country at war, and trade will cease. Political turmoils cause major changes in currency exchange rates, resulting in trade becoming more expensive (thus less attractive), or vice versa. When the value of a specific currency decreases, import becomes more expensive, yet the country’s products become cheaper for foreign markets. While this can be interpreted as an advantage (to a certain extent), it’s an opportunistic advantage. Many companies will seek long term suppliers and avoid highly volatile and thus unpredictable markets. Import duties/taxes: when import duties are raised (trade barriers), the products become more expensive for importers, and thus import is likely to decline. Buyers will search for new suppliers from other markets (for which lower import duties apply), or local production will receive a boost. The need and the difficulty to comply with various procedures (at the country of export and at the country of import) concerning environmental, health or safety regulations. Automation and predictability of supply chain. Buyers like predictability. They want to know when their products will arrive. If for example Customs operations in the country of export are not streamlined, such that shipments often are delayed a long time at the border, trading with that country becomes less attractive. Automation of procedures speeds up border operations, and contributes to predictability and thus to the attractiveness of a country as a trading partner. Why is global trade important? It generates incomes for governments, which are subsequently invested in social programs, in infrastructure and in improving the quality of life. What are global trade flows? Trade flow refers to the sales and delivery of products (and services). “Global trade flows” refers to the total flow of goods between countries. As discussed above, in this article we refer only to trade in goods, not in services. Yet for completeness, one should understand that trade includes also services. What was global trade in 2017? According to the WTO (World Trade Organization) World Trade Statistical Review 2018, “in 2017, world merchandise trade recorded its strongest growth in six years”. Merchandise trade grew by 4.7% in volume and 11% in value (compared to the previous year), and reached US$ 17.73 trillion. The report adds that “all regions recorded merchandise trade growth in volume terms in 2017 apart from the Middle East”. The countries with most export are (in decreasing order) China, The U.S. and Germany. The countries with most import are (in decreasing order) the U.S., China and Germany. How does global trade evolve? The WTO (World Trade Organization) World Trade Statistical Review 2018 provides a very interesting graph. First, it shows that trade volumes have been growing in a reasonably stable pace until 2016, yet 2017 achieved a peak in growth. Second, it shows that the world has recovered from the steep decline in trade value (although not volume) in 2015, and the value of trade in 2017 achieved record growth. How big is global trade in coffee? According to the UN COMTRADE database, the total exports of goods classified under commodity code (Harmonized System code) 0901 (Coffee, whether or not roasted or decaffeinated; coffee husks and skins; coffee substitutes containing coffee in any proportion) in 2017 was 26.707.086.043 USD, thus roughly 26,7 billion U.S. Dollars. Are you interested in another commodity? You can perform a query and download the statistics from the COMTRADE database. What is the contribution of global trade to GDP? Some countries rely on trade more than others, therefore the answer to this country differs per country. The World Bank offers a portal where these statistics are available per country: https://data.worldbank.org/indicator/TG.VAL.TOTL.GD.ZS . A study by the Erasmus University Rotterdam and the Port of Rotterdam in The Netherlands showed that the Port of Rotterdam (being the largest port in The Netherlands, and in Europe) contributes 45,6 billion Euro to the Dutch economy, i.e. 6,2% of the Dutch GDP. Is global trade with China increasing? The statistics above – in response to the question “What is the trade balance between the U.S. and China?” – show clearly that trade between the U.S. and China has been increasing, and Chinese exports to the U.S. by far exceed Chinese imports from the U.S.
China is the largest exporter of merchandise worldwide (by far exceeding the U.S., the second largest exporter) and the second largest importer worldwide (measured by the value of import/export). The value of Chinese exports in 2017 was 2263 billion USD, representing a growth of 8% compared to 2016. The value of Chinese imports in 2017 was 1842 billion USD, representing a growth of 16% compared to 2016. 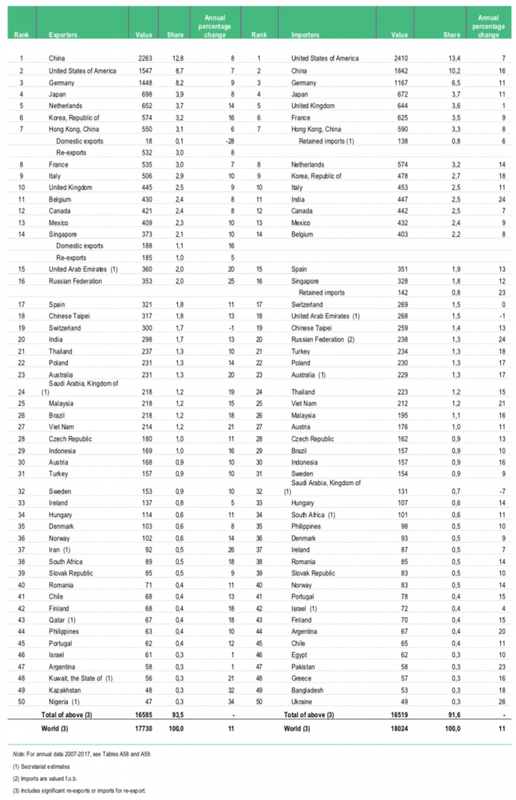 The table below provides an overview of leading exporters and importers in world merchandise trade in 2017, measured by the value of their imports and exports (in billion dollars and percentage). This table is taken from the WTO World Trade Statistical Review 2018. Most traded goods are manufactured goods. Other large categories are fuels and mining products and agriculture. Trade in manufactured goods has been growing much more substantially than trade in fuels and mining products and agriculture. Will Brexit affect international trade? So far the UK has been part of the European Customs Union, and thus no Customs procedures had to apply in trade between the UK and the EU-27 countries (including e.g. Germany, Spain, Italy, France, Belgium and The Netherlands). Once the UK leaves the EU, Customs procedures will apply to trade between the UK and EU-27 countries (the remaining 27 Member States of the European Union), thus imposing severe trade barriers. For companies in the EU-27 countries it will become much more complex to buy from or sell to companies in the UK. Consequently, it will become attractive for these companies to seek for other suppliers, and maybe even other customers, outside the UK. This negative impact can be reduced if the UK signs an agreement with the EU to streamline Customs procedures with minimal administrative burden for traders. Once Customs procedures apply to trade between the UK and EU-27 Member States, there will be delays at the borders between the UK and the EU. Border crossings may become the bottleneck of trade if they are not able (physically) to accommodate efficient border inspections while minimizing delays and queues at the border. Major disruptions are feared in the border between Ireland and the UK. The UK will no longer be eligible to use Free Trade Agreements that have been signed between the EU and other countries, for example Canada and South Korea. Consequently, new trade barriers will be imposed on trade between the UK and other nations. This scenario can be mitigated if the UK negotiates separate trade agreements with these countries. Negotiating, signing and approving trade agreements may however be a lengthy process of several years. No single entity controls world trade. Trade is the result of companies that are located in different countries buying from and selling to each other. As such, it is decentralized by default. The World Trade Organization (WTO) is a cross-governmental organization, in which 164 nations are members. These nations represent 98% of world trade. Nations negotiate trade agreements and solve trade disputes through the WTO. What is international trade policy? The term International trade policy describes the ideas, plans, laws, and agreements concerning the trade in goods between different countries, as has been agreed by their national governments or by supranational bodies such as the WTO or the European Union. Just like countries have policies about their health systems, their education systems, foreign policy, and defense policy, they also have policies around international trade. Similar to other policies, international trade policies can sometimes be used as a political instrument to put pressure on other stakeholders. In the case of international trade policy, the successful implementation of the policy is always dependent on the policy of other countries, because trade by definition involves other countries. In this sense, international trade policy differs from policy areas that are more predominantly internal, such as health and education. 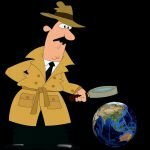 What is global trade compliance / what is customs and trade compliance? Trade compliance is the process of ensuring adherence to all the laws, rules, regulations and procedures governing all trade between two or more countries. As these system of obligations is determined per country (or economic region), compliance entails dealing with requirements of multiple countries. What are the repercussions of a trade compliance violation? Repercussions vary greatly, as trade compliance includes a very diverse range of topics, and as rules differ per country. Repercussions can include e.g. fines (monetary penalty), criminal procedures/fines, imprisonment and/or denial of export/import/transit license, which may in turn result in inability to do business. Involvement in such cases may also result in brand (image) damage to the company. Is Blockchain the answer to the problems in Global Trade and Logistics? What are the important characteristics of Blockchain? Why is Blockchain suitable for global trade? How will Blockchain protect a company’s information while using a shared ledger? How will Blockchain impact global trade compliance? What about IBM Blockchain for trade logistics? What are the hurdles for adoption of Blockchain in trade? Will Blockchain solutions for trade finance be merged with Blockchain supply chain solutions? What is the role of Customs in trade? Customs is the primary organization tasked with governing trade compliance. While other Government agencies typically have a role in dealing with specific risks (e.g. the ministry of agriculture has a role in compliance with health regulations), often (i.e. in many countries) Customs has the coordinating role among all agencies that have a stake in border controls. Customs administrations often perform tasks on behalf of the other agencies. For example, in the EU Customs oversees control of various areas, which are explained further on the website of the EU Directorate General for Taxation and Customs. How does customs facilitate trade? While Customs has a role in governing trade compliance, it also has a role in facilitating trade, as a means to stimulate economic activity and to attract foreign investments. This is achieved by ensuring easy border procedures and fast and predictable Customs clearance operations. A number of international benchmarks measure how easy it is to do business with a country; the simplicity, speed, and predictability of Customs clearance are measured by these benchmarks as a key KPI. What is customs-trade partnership against terrorism? The Customs Trade Partnership Against Terrorism (CTPAT) is an element in the cargo enforcement strategy of the U.S. Customs and Border Protection’s (CBP). It is a voluntary public-private sector partnership program “which recognizes that CBP can provide the highest level of cargo security only through close cooperation with the principle stakeholders of the international supply chain such as importers, carriers, consolidators, licensed customs brokers, and manufacturers” (text taken from www.cbp.gov). When a company requests to join CTPAT, “an agreement is made to work with CBP to protect the supply chain, identify security gaps, and implement specific security measures and best practices. Applicants must address a broad range of security topics and present security profiles that list action plans to align security throughout the supply chain”. Because of their pro-active role in preventing, identifying, mitigating and reporting risls, CTPAT members are “considered to be of low risk, and are therefore less likely to be examined at a U.S. port of entry”. What is Authorized Economic Operator (AEO)? The term AEO is used outside the U.S. for a similar type of public-private sector partnership program. In different countries the AEO program can focus either on safety & security risks (like in the U.S.) or on fiscal risks, or on both. If you wish me to provide answers to more questions related to trade, add your question in the “Comment” box below., or contact me via the “Contact” page.